最近使用 rabbitmq 來架構一個 High available 的 message framework, 不過使用了一陣子之後發現其實它在 HA 的部份仍然有不少的問題, 分享出來給大家參考. 前陣子的文檔並沒有說明這點, 我也是在實驗之後才發現這件事, 用下面這張圖來解釋, 原本的 B1 ~ B5 組成 cluster, 但可能因為 B1 和 B2 所在的 Switch 壞掉了, 所以把 B1 ~ B5 切成了上下兩個 cluster. 在這種狀況下, 雙方都可以正常運作, 但當我們把壞掉的 Switch 換掉之後, 卻發現上下兩個 cluster 卻不會自動回復成一個 cluster. 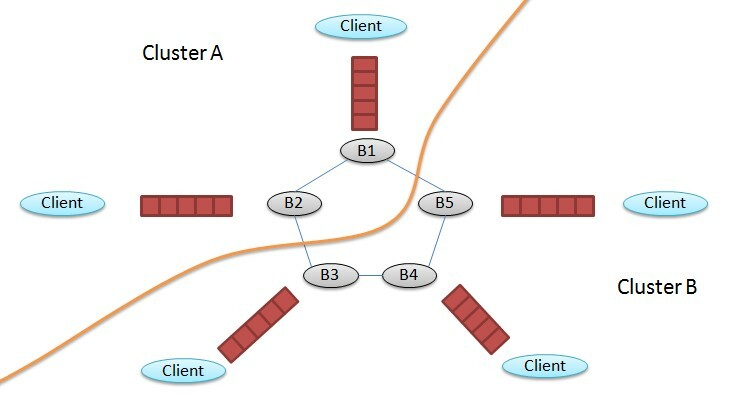 你再也無法從 cluster A 內的點送訊息到 cluster B 內的點. 在文檔中雖然有提到 cluster 不適合 WAN, 所以建議使用 shovel/federation 但就實際面來看, 即使是 LAN 也還是會遇到 network partition 的事件, 當遇到這種狀況時, 你必須要重啟其中任何一個 broker, 讓它重新去掃所有的 cluster 成員, 這時候上下兩個 cluster 就會再合併起來了. 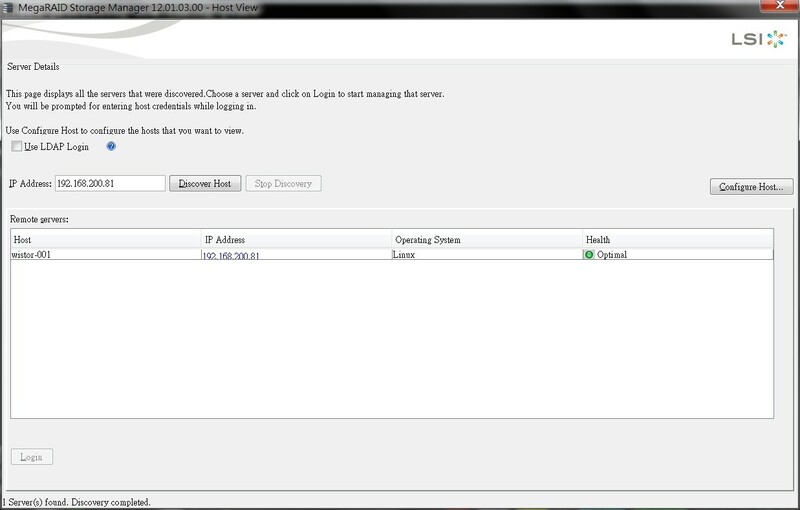 All disk nodes must be running for certain operations, most notably leaving a cluster, to succeed. At least one disk node should be running at all times. When all nodes in a cluster have been shut down, restarting any node will suspend for up to 30 seconds and then fail if the last disk node that was shut down has not been restarted yet. Since the nodes do not know what happened to that last node, they have to assume that it holds a more up-to-date version of the broker state. Hence, in order to preserve data integrity, they cannot resume operation until that node is restarted. 上面的說明的情況就是當你的 cluster 建立起來之後, 如果你要全面關機維修時, 你一定要記得最後關的是那一台, 而那一台在關機維修之後, 必須要先開機, 你無法以任意的順序開機. 其實這種狀況一般來說是不太容易遇到的, 因為"全面"關機不是一個機房該做的事, 應該是依序維修, 一台維修完就立即開機, 再繼續維修下一台. 但考慮到一個機房遇到最糟的事情就是發生了斷電, 即使全部的機器依序自動關機, 那請問下次開機時, 你要如何知道那一台是最後關機的?! 另外我也針對某個特殊狀況進行模擬, 如果最後有三台機器在同一秒內關機, 那下次開機時, 誰要先開啟? 答案是誰先開啟都沒用, 這三台必須要同步開機後, 同步把 rabbitmq-server 重啟, 才能夠把 cluster 重建回來. 相當的麻煩, 我在下面這個連結內也看到同樣的討論, 目前是還沒有解答的. 討論完了 broker 的部份, 再來看一下 queue 的部份, 為什麼 queue 也需要 HA 呢? An exception to this are message queues, which by default reside on the node that created them. 也就是 client 端還必須要自行 handle 一個 cancel event, 然後要自動的連結到新的 queue, 才有辦法拿到 message, 就我目前 survey 的狀況來看, 目前還沒有 client 端的程式 (kombu/pika/pyamqp), 有處理好這個問題. 如果這個狀況有變化的話, 還麻煩也通知我一聲. 如果有朋友對 distributed message queue 也有興趣的話, 也歡迎一起討論, 台灣對這塊的東西討論實在不太多. 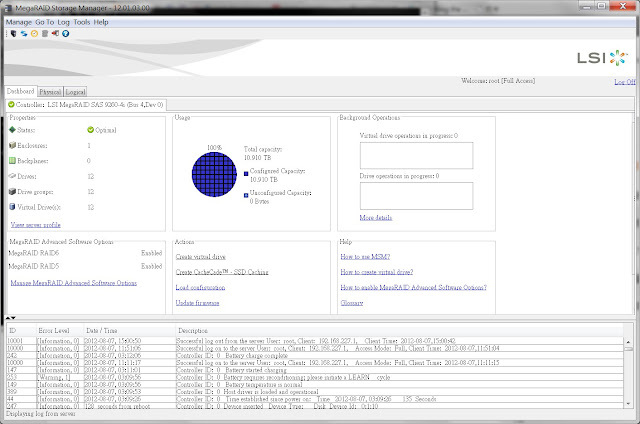 SAS-IR SNMP Agent supports only Redhat and SuSE releases.